(9:16:22 AM) Myze: It gets better after FL, and when you get good enough at driving to do FL + towers, it gets really fun. (9:16:45 AM) Faulsey: Scuse me, hunting for Mankrik’s wife. Gotta noob up barrens chat. (9:17:07 AM) Myze: Mankrik is geared fine, it’s his wife that was the noob. (9:17:23 AM) Faulsey: Pff, have you seen his wife? I’d have bumped her off, too. (9:18:00 AM) Faulsey: The kind of Husband that doesn’t want her to be found, but instead wants people to die horribly. .-= Faulsey´s last blog ..Let the tanking begin! =-. I picked up the quest on my baby cow and found her shortly later. Apparantly they have updated the quest text to atleast give you clue as to where to go. Anyway I’m not going to turn in the quest… instead I will share the quest anytime someone asks to share quests in a dungeon or raid. 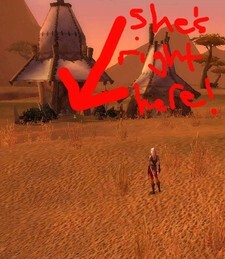 My buddy created an orc chick named Mankrikwife… now we just need her to die near Mankrik. Since its a pvp server we will probably just wait till alliance attacks crossroads which is atleast 4 times a day. .-= Whatsmymain´s last blog ..Ode to Min Maxing =-.